I’ve found some more prints of pretty clothes and thought I’d share them with you. Unfortunately one is in black and white but I hope you will still like it. My favourites though are the two morning dresses. That green one must have looked so beautiful in real life. The sleeves are big but not overly so and I really love the foliage detail down the front. What do you think of these dresses? Walking dress of Sontag-green gros de Naples. It is made en redingote, with a rich trimming of foliage down the front of the skirt. Corsage made uni, and without trimming, It is finished at the neck with a triple quilling of tulle, fastened in front with a bow of rose-coloured satin ribbon. The sleeve is full from the elbow to the wrist, where it is confined by a broad gold bracelet. 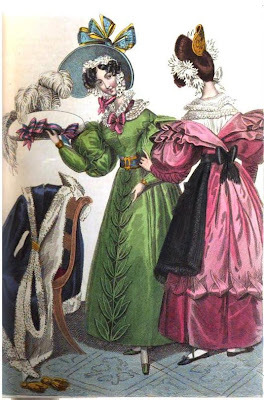 The upper sleeve is very full, and is confined round the arm by a band cut into six or seven points, from whence proceed an equal number of broad straps, which reach from the hand, round the arm, to the shoulder, where they terminate in points, and are fastened to the corsage by corded knots. Bonnet of pale blue velvet, made open in front, and trimmed with velvet ribbon. It is worn over a morning cap of fine lace, which is tied under the chin with rose-coloured gauze ribbon. Morning dress of rose-coloured merino. The skirt has a broad hem at bottom, headed by doubled languettes, the points of which cross each other, and form a novel and pretty style of trimming. The sleeve is cut into long transverse straps, half way up the arm, interlacing each other so as to fit very closely. The top of the sleeve is very large, and is supported by an under-sleeve of stiffened net.The body of the dress is cut in a point nearly to the waist. A double cape, set in very full quills on the shoulders, and crossing the bust en schall, before and behind. A richly worked cambric chemisette is worn with this dress. The hair is dressed in soft curls in front, and in one large bow on the crown of the head. Caprice of British blonde, tied under the chin with white gauze ribbon. The comb worn with this head-dress is of gold, with a very high back. Shoes of black satin. The mantilla thrown over the chair in this plate, is of purple satin, lined and trimmed with white plush. It is cut very short behind not more than half a yard deep from the waist downwards, and becomes deeper towards the front, where it forms an acute angle, reaching almost to the feet. The points are terminated by rich bullion tassels. It is an appropriate and elegant finish for an Opera dress. The beret above the mantilla is intended to be worn with it. It is made of white satin, with noeuds of striped gauze ribbon, tastefully disposed inside the brim. Three soft white feathers fall over the crown on the right side. Pelisse of aventurine satin. The skirt is made very full, and rather long. It is trimmed down the front with a deep revert of satin, cut in progressive murals, decreasing in size as they ascend. The body is made plain, close up to the throat, with a large square collar, and has a double cape, set on en coeur. The upper cape is narrow, and cut in five points on the shoulder; the lower cape is considerably deeper, and not pointed, but falling in folds over the sleeve. Both capes are quite narrow at the waist. The sleeve is as close to the arm as possible from the elbow downwards, but very large at the upper part, appearing still more so by the addition of a broad piece of satin, set on full from the elbow to the shoulder. Noeuds of corded satin are placed at equal distances down the centre of this appendage. The bonnet accompanying this dress is of avenlurine satin, lined and trimmed with deep blue velvet, and rich ribbon. It is small and peculiarly becoming. Boa of swans down. Gloves of blue kid, or gros de Naples. Boots of aventurine cloth, lined with sable. Carriage dress of pink and green shot gros de Lyons. A very pretty garniture finishes the skirt of this dress: it is composed of lozenge-shaped pieces, set on a corded band in groups of three, and so disposed, that the centre lozenge of each group shows the corded band passing through it, and seems to confine that on each side of it. The corsage is high behind, and partially open in front. A fluted trimming proceeds from the waist, across the shoulder to the bottom of the back. The clochettes forming this trimming become larger from the waist towards the shoulder; and smaller from thence backwards. The upper part of the sleeve is large, and divided in two parts lengthwise, each part turning back, and forming a full revers, which are laced together, but not quite closed. 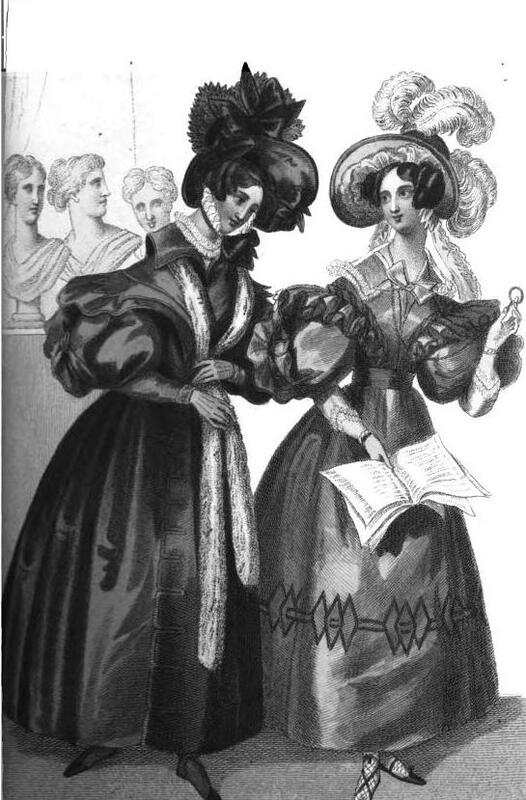 The lower sleeve is tight to the arm, and is finished at the wrist with a deep pointed cuff, trimmed with quilled net. Collarette of clear net, edged with a double quilling, and fastened in front with a noeud of gauze ribbon. Bonnet of green plush, lined with Isabella coloured satin, and trimmed with gauze ribbon to match. The crown slopes forward, and is surmounted by a beautiful plume of ostrich feathers. Gloves of Isabella kid. Shoes of black satin.